Endless Swarn – Collection CD is out! More info at Abusive Noise Tapes! Continue reading Endless Swarn – Collection CD is out! First look at Haggus / G.O.D. split! Continue reading First look at Haggus / G.O.D. split! Infest is going to UK! Continue reading Infest is going to UK! At the end of 2018, there was 44 large breweries and over 450 microbreweries in the Czech Republic. It means there is one brewery for every 20 thousand citizens while neighbouring Germany has a density of only one brewery for every 50 thousand citizens. What more – on average, the is one microbrewery being opened in the Czech Republic every week. So, by the time OEF 2019 starts, there will be about 530 operating breweries in Czech. What a paradise for beer lovers! Since OEF has always been about introducing new bands, original music and captivating performances, we want to … Continue reading Beer Revolution at the OEF! You can check all these releases HERE! Continue reading Big update from Knochentapes! Continue reading Hørdür / Warfuck tour! Gate – Resurrection Of Relenledd God LP! Japan blast beat to the max. Gate formed in 1999 as a 3-piece grindcore band, gate 1st full album, unleashed emotionless and relentless blastbeats with cold hateful vomited vocals over razor sharp riffage. With a lineup change in 2015, Murata from cyber-grindcore band Deathcount and Ishiguro who plays in many extreme metal bands both joined the Gate. 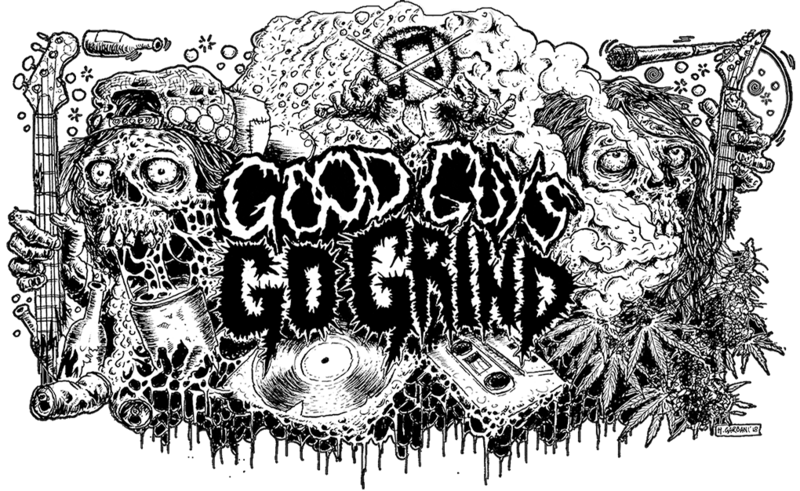 Get ready for 21 tracks mind melting grind. FFO 324/Discordance Axis. You will find more info at http://www.rsr-hateape.com Continue reading Gate – Resurrection Of Relenledd God LP! Continue reading This Saturday in Moscow! Split Intestinal Disgorge / Inopexia is out! You can order a copy or just listen the whole split at nobread.bandcamp.com Continue reading Split Intestinal Disgorge / Inopexia is out! First look at Endless Swarm / Nothing Clean split tape! The Tapes will be only available on Tour! More details at Coxinha Records! Continue reading First look at Endless Swarm / Nothing Clean split tape! UNSU is preparing a new album, which will be releases on 17 of May! You can listen few new tracks HERE! Continue reading Great news from French grinders! New Galvanizer LS and tees! More info at http://www.everlastingspew.com Continue reading New Galvanizer LS and tees! Special proposition from Here And Now Records! more info is HERE! Continue reading Special proposition from Here And Now Records! Long delayed material is finally will be released. 11 songs (plus a CD only bonus track) were recorded live in studio when Internal Rot played in New York in 2011. CD released by Blastasfuk April 20th and 12” via Psychocontrol later this year. Continue reading Great news from Internal Rot! Finnish away team is going to UK! Continue reading Finnish away team is going to UK! Split Active Stenosis / Endotoxaemia is out! Contacts for orders / trades: garbagebondage@mail.ru Continue reading Split Active Stenosis / Endotoxaemia is out! Gets Worse – 2014 – 2018 / Burnout – 2016-2018 Totality / More info Continue reading Two new releases from Abusive Noise tapes! New album from Gets Worse is out! You can order CD version at No Bread rec! Continue reading New album from Gets Worse is out! Noisem & Corrupt Moral Altar are going to big trip! Continue reading Noisem & Corrupt Moral Altar are going to big trip! You can send your pre-orders to Sneezing Pus / Vomi Noir / Mono Canibal / EveryDayHate Continue reading Split Vomi Noir/Sneezing Pus will be out in few weeks! Avalaible in 5 colors : Red Cardinal / Green / Dark Grey / Black / Burgundy / S / M / L / XL Send your questions and orders to hordurgrind@gmail.com Continue reading New shirts from Hørdür! Cruel Face is going to Europe! Continue reading Cruel Face is going to Europe! Continue reading Doomstar Booking Present! More info at official Slund page in facebook! Continue reading Puta Malaria/Slund! CSSO – Vimukti / Vimokasa tape is out! Cult grind legend from Japan! First time on tape! From Anatomical Underground Deeps! Side A: 1993 Demo, releases as split with Meat Shits on 7 inch Side B: split with Vivisection, originally released on 7 inch! Contains original artwork on pro tape, two side colored (white and red), factory sealed! Continue reading CSSO – Vimukti / Vimokasa tape is out! Continue reading Gets Worse / Jack split tour! First looks at Sedem Minút Strachu / Chikara! This split will be released very soon, but you can already listen both sides HERE! Continue reading First looks at Sedem Minút Strachu / Chikara!